Have you ever wondered how your computer talks to other computers on your local LAN or to other systems on the internet? Understanding the intricacies of how computers interact is an important part of networking and is of equal interest to a sysadmin as well as to a developer. In this article, we will make an attempt to discuss the concept of communication from the very basic fundamental level that needs to be understood by everybody. This layer provides backbone to data flow between two hosts. This layer receives data from the application layer above it. There are many protocols that work at this layer but the two most commonly used protocols at transport layer are TCP and UDP. TCP is used where a reliable connection is required while UDP is used in case of unreliable connections. TCP divides the data(coming from the application layer) into proper sized chunks and then passes these chunks onto the network. It acknowledges received packets, waits for the acknowledgments of the packets it sent and sets timeout to resend the packets if acknowledgements are not received in time. The term ‘reliable connection’ is used where it is not desired to loose any information that is being transferred over the network through this connection. So, the protocol used for this type of connection must provide the mechanism to achieve this desired characteristic. For example, while downloading a file, it is not desired to loose any information(bytes) as it may lead to corruption of downloaded content. UDP provides a comparatively simpler but unreliable service by sending packets from one host to another. UDP does not take any extra measures to ensure that the data sent is received by the target host or not. The term ‘unreliable connection’ are used where loss of some information does not hamper the task being fulfilled through this connection. For example while streaming a video, loss of few bytes of information due to some reason is acceptable as this does not harm the user experience much. This layer is also known as Internet layer. The main purpose of this layer is to organize or handle the movement of data on network. By movement of data, we generally mean routing of data over the network. The main protocol used at this layer is IP. While ICMP(used by popular ‘ping’ command) and IGMP are also used at this layer. This layer is also known as network interface layer. This layer normally consists of device drivers in the OS and the network interface card attached to the system. Both the device drivers and the network interface card take care of the communication details with the media being used to transfer the data over the network. In most of the cases, this media is in the form of cables. Some of the famous protocols that are used at this layer include ARP(Address resolution protocol), PPP(Point to point protocol) etc. One thing which is worth taking note is that the interaction between two computers over the network through TCP/IP protocol suite takes place in the form of a client server architecture. Client requests for a service while the server processes the request for client. Now, since we have discussed the underlying layers which help that data flow from host to target over a network. Lets take a very simple example to make the concept more clear. Consider the data flow when you open a website. As seen in the above figure, the information flows downward through each layer on the host machine. At the first layer, since http protocol is being used, so an HTTP request is formed and sent to the transport layer. Here the protocol TCP assigns some more information(like sequence number, source port number, destination port number etc) to the data coming from upper layer so that the communication remains reliable i.e, a track of sent data and received data could be maintained. At the next lower layer, IP adds its own information over the data coming from transport layer. This information would help in packet travelling over the network. Lastly, the data link layer makes sure that the data transfer to/from the physical media is done properly. Here again the communication done at the data link layer can be reliable or unreliable. This information travels on the physical media (like Ethernet) and reaches the target machine. Now, at the target machine (which in our case is the machine at which the website is hosted) the same series of interactions happen, but in reverse order. The packet is first received at the data link layer. At this layer the information (that was stuffed by the data link layer protocol of the host machine) is read and rest of the data is passed to the upper layer. Similarly at the Network layer, the information set by the Network layer protocol of host machine is read and rest of the information is passed on the next upper layer. Same happens at the transport layer and finally the HTTP request sent by the host application(your browser) is received by the target application(Website server). One would wonder what happens when information particular to each layer is read by the corresponding protocols at target machine or why is it required? Well, lets understand this by an example of TCP protocol present at transport layer. At the host machine this protocol adds information like sequence number to each packet sent by this layer. At the target machine, when packet reaches at this layer, the TCP at this layer makes note of the sequence number of the packet and sends an acknowledgement (which is received seq number + 1). Now, if the host TCP does not receive the acknowledgement within some specified time, it re sends the same packet. So this way TCP makes sure that no packet gets lost. So we see that protocol at every layer reads the information set by its counterpart to achieve the functionality of the layer it represents. On a particular machine, a port number coupled with the IP address of the machine is known as a socket. A combination of IP and port on both client and server is known as four tuple. This four tuple uniquely identifies a connection. In this section we will discuss how port numbers are chosen. You already know that some of the very common services like FTP, telnet etc run on well known port numbers. While FTP server runs on port 21, Telent server runs on port 23. So, we see that some standard services that are provided by any implementation of TCP/IP have some standard ports on which they run. These standard port numbers are generally chosen from 1 to 1023. The well known ports are managed by Internet Assigned Numbers Authority(IANA). While most standard servers (that are provided by the implementation of TCP/IP suite) run on standard port numbers, clients do not require any standard port to run on. Client port numbers are known as ephemeral ports. By ephemeral we mean short lived. This is because a client may connect to server, do its work and then disconnect. So we used the term ‘short lived’ and hence no standard ports are required for them. Also, since clients need to know the port numbers of the servers to connect to them, so most standard servers run on standard port numbers. The ports reserved for clients generally range from 1024 to 5000. Port number higher than 5000 are reserved for those servers which are not standard or well known. If we look at the file ‘/etc/services’, you will find most of the standard servers and the port on which they run. As you see from the /etc/services file, FTP has port number 21, telent has port number 23 etc. You can use ‘grep’ command on this file to find any server and its associated port. As far as the standards are concerned, the following four organizations/groups manage the TCP/IP protocol suite. Both the IRTF and the IETF fall under the IAB. The Internet Architecture Board (IAB). The IAB falls under the ISOC. You left out the most popular application layer protocol – HTTP! Thank you for the clear explanation! I’ve always wanted to learn a little about TCP/IP. Keep the good work! This reminds me of my Cisco Lessons, thanks for the “refresh”. Yes. HTTP is the most popular application layer protocol. This is why the “TCP/IP Concept Example” section explains it using the HTTP protocol. Anyway, thanks for pointing it out, HTTP is added to the “Application Layer” section to make the list complete. Seems redundant to the OSI model. Some books say the 5000 upper limit for client (dynamic/ephemeral) ports was a misprint in W. Richard Stevens’ “TCP/IP Illustrated Vol. 1” and should have been 50000. The issue doesn’t seem to have affected the progress of the protocol in taking over the world. OK. Can you provide some references? You forgot the physical layer. Well, I think you are talking about the OSI model where physical layer is the last layer. In TCP/IP model Data link layer is the layer 1. Sometimes this layer is also referred to as “Network Interface Layer” as as to avoid confusion with the data link layer of the OSI model. This Network interface Layer encapsulates physical layer also. Thanks. Short and informative article. 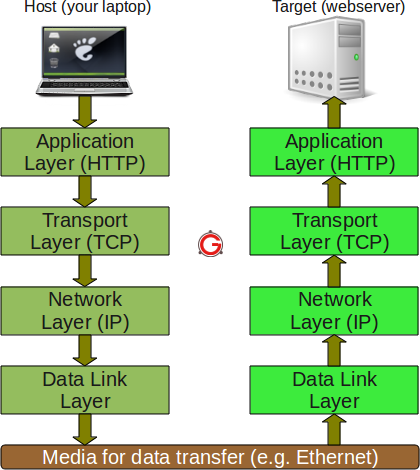 an application uses ephemeral port and it uses http as application layer protocol. Now when the packet is sent to destination, will it contain both ephemeral destination port and standard http destination port no. How this packet will be handled by transport layer and application layer at destination? wireshark or any other tool could be used to show “how” this happens in real time. Useful Information in Short. Well Done!! Explanation is good and if there any blogs related to this subject please mention it or please mail me..
An extremely clear, concise and lucid explanation of TCP/IP. We’ll written in a language that I find easy to read and understand. Thank you. very nice, in short & informative explanation. Useful for those who have keen interest in Internet. thanks for this article. Quite good. Explanations are very easy to read and understand. I would like to know more depth about encapsulation and decapsulation process of pkts in source side and destination side. I really found useful article coz…before the exam usually I don’t read the book I just look and search the info…in the net…. 1. what is a transport protocol? Can you compare Modbus TCP and IEC 61850? What are the advantages and disadvantages between these two communication protocols? dear friend thanks a lot u helped me to understand .thanks♥. awesome article.. I had a 3 hour class yesterday but I learned more clearly from this article than I did in that class. So thanks a lot.. really appreciated!! Can u just tell me the order of osi layer. 1 > 7 or 7 <1 which 1 is correct? any possibility to increase the TCP/IP ports more than 65355. The internet model or TCP/IP reference model specifically applies to internet worked systems, and has 4 layers. The movement of data packets across a network would be managed by which layer? nice details on TCP/IP basics. Thanks for the short cut TCP/IP lesson. I’m a bit of a hack with interoperability. Helped me to understand where to look when I’m stuck. Well done! Very informative and an excellent refresher.